Ep. 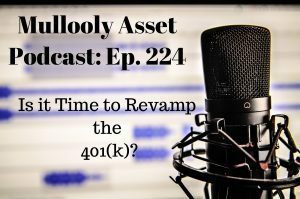 224: Is it Time to Revamp the 401(k)? In Ep. 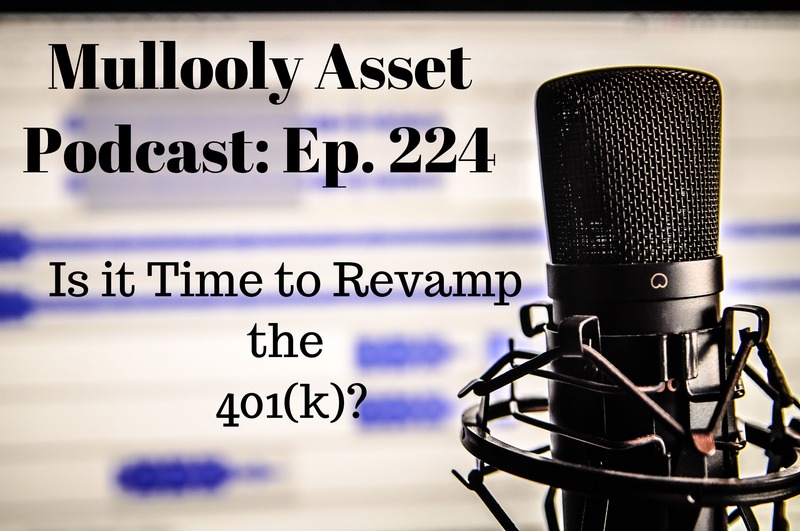 224 of the Mullooly Asset Podcast, Brendan and Tom break down a recent article from the Wall Street Journal that talks about auto-enrollment rates for 401(k) plans. This leads to a bigger discussion about the 401(k) plan as a whole, and the purpose of the workplace retirement plan. Is it perhaps time to think of a new way for individuals to save for retirement that ISN’T tied to their jobs? Find out Brendan and Tom’s take by listening to this episode! Tom Mullooly: Welcome to the Mullooly Asset Management podcast. This is episode number 224. I’m Tom Mullooly and I’m here with Brendan Mullooly, and we cover topics that come up in conversations with our clients, peers in our industry, and topics of the day that we think are worth covering for our listeners. Before we turned the mic on, Brendan and I were talking about an article that was published recently in the Wall Street Journal by Anne Tergesen, a pretty good article, based on 401(k) accounts and what’s happening with them. Brendan Mullooly: Yeah, so she was looking at 401(k)’s. Auto enrollment has become more and more prevalent over the last decade or so, let’s call it. While that has definitely begun to solve the issue of how to get people to save for retirement, it’s funny the answer is that you more or less force them into it. How do they keep the money in these 401(k)’s now that it has arrived. Tom Mullooly: Sure, they have money in the account, and so some people may say, “Hey, I don’t want to enroll in the 401(k) because I’m saving money for a house,” or “I’m still paying down student loans.” Maybe I’m in my 20’s and I’m not ready to start doing that, good reason. We’ve done several podcasts and videos, and blog posts, about this very reason, that just because your company offers a 401(k) doesn’t necessarily mean it’s the smart move for your situation. It’s not really the smart move for everybody. Brendan Mullooly: This is becoming commonplace, then, to have the auto enrollment, right? Tom Mullooly: You’re probably going to see one. Tom Mullooly: So another feature, I should say another point in this article about money coming out of the plans that have auto enrollment, the numbers themselves are kind of flawed because when people leave a job, and they go to another job or they just leave, one of the things that they cited in the article was after leaving a company, just over 60% of 401(k) participants that have balances below $10,000, they just liquidate their account. They’ll pay the taxes, they’ll take a penalty. Most folks when they … Say they’ve got $10,000, and they just take it instead of rolling it over, you’re really going to, depending on your tax bracket, that $10,000 could become 5800 pretty quick. It doesn’t really make sense, but some people get laid off, they need the money. They’ve got to live on it. It’s a tough situation. Brendan Mullooly: I think auto enrollment is good. This is a little bit self-serving for me. I think in a perfect world, you would get… Some companies do this, you get guidance from a CFP or an advisor in some capacity that your business brings in, in addition to just offering a plan with auto enrollment because this decision is nuanced. It’s like, “Okay.” So you have a 401(k). You’re going to be auto enrolled, so you should be educated about what that means because I think a lot of people probably don’t. Then, you should really be looking at your cash flows and deciding if this is really the best place for your money, and you want to consider other factors like are you foregoing a company match? Let’s take all of the stuff into account to help you make an educated decision, because I think when people do it that way, sure there are emergencies and extenuating circumstances, but I think the odds of the money remaining in the plan are even better if you’re considering all these things. But auto enrollment is the easy one because that’s like an on/off setting for the plan. Sitting down with each person who participates in the plan is an expensive proposition and business can’t afford to do that kind of stuff for all of their employees, most of the time. Tom Mullooly: I’m just thinking, as I’m listening to you, I’m thinking about something that we discussed on a podcast, and I think we’ve actually tweeted this out in the past as well, but if companies are going to go to the expense of having a 401(k) plan, they’re not cheap especially if you’ve got a big organization, why can’t they consider having or giving access for their employees to a CFP before they even enroll as part of their employee benefit package, and just say, “Look, we don’t want you to be worried about money when you’re here working. We want you to work. We want you to sit down with this counselor, with a CFP, and he’ll go through some numbers with you. If you really want to dig down and get into specifics, you can. If you want to just go through the basic finance math, you can do that too,” but at least make it available because I think that a lot of people sign a lot of forms the day they sign up at a new job and they don’t even understand what they’re getting involved in. Then, they get their first paycheck and they’re like, “Wow. What happened to my pay? Where’d it all go?” So, I think that’s something that companies ought to consider. When you’re putting together your benefit package, maybe having access to a CFP for your employees would be a good way to go, and it would help from people getting into this mess where they’re getting auto enrolled, and then they’re taking loans right away from their account. Remember, when we’re talking about taking loans from your account, usually people have taken the money out because they need it. They’re not taking it out for any other reason. They need it to pay off some other loan, or they need it to do something else. Cash flow management, really important, and so I think that it would be in everyone’s best interest to spend some time, I know this sounds self-serving because we do financial planning, but I think it would be in people’s best interest to sit down with a planner before they actually decide to enroll or at what level they’re going to enroll. Tom Mullooly: Yeah, it is. Brendan Mullooly: -where somebody’s telling you what to do. Brendan Mullooly: -and I don’t think that employers really can tell … They can’t tell people what to do with their money. Tom Mullooly: I understand that it does seem big brother-ish and you look back 50, 60, 90 years ago when people worked and there wasn’t a 401(k) plan. It was a pension that you got. We just did video 102 on our website that talked about all these people who save, save, save, save, save in a 401(k) plan if you’re over 55 years old. Some people now have what works out to be an average income projection of $600 a month from their 401(k) plan. If that 401(k) plan were a pension, that pension manager would be fired, and then he would be sued for those kind of terrible returns. Brendan Mullooly: Is it the returns though, or is it them not putting enough money into it, because that’s also the problem you see with pensions. They’re under-funded, and that’s more the issue than the investment returns. I don’t really think that that is what people have flubbed over the years. They probably just didn’t send in enough money to replace their paycheck in retirement, because that’s more what we’re talking about here. Tom Mullooly: True. So, people aren’t saving enough. We’ve even gone through the math, that if you’re saving the max, if you’re saving $18,000 a year … 10 years ago it was $9000. The numbers 15 years ago were $7000. That was the max you could put into your plan, and it’s been upgraded over the last several years, but even if you’re maxing out your retirement plan contribution to your 401(k), your deferred comp, your 403(b), whatever it is, that’s not going to be enough. Brendan Mullooly: An interesting point, though, that I heard recently was, I forget. They had percentages, but we harken back to these days when “everybody” had a pension, and that wasn’t even the case back in like the 40’s, the 50’s, the 60’s. Brendan Mullooly: It was still only like half of people, so there was no … We’re remembering a time that doesn’t exist is what I’m saying. We’re remembering this as if the good ole days were like everybody in the entire country had a pension, and no one had to worry about anything, and that isn’t the case. I actually think this was … This might’ve been Michael Batnick’s piece that he did on … He talked about this crisis with a lot of the pension systems and what’s going on. He touched on a number of different things in it, but I think that was one of them, and maybe that’s where I saw it, but I thought that that was an interesting point because we have that tendency to do the thing where we look back and say, “Everything was great back then,” but then, okay, so let’s rewind the clock. When you were living through it, was it that great, because it never feels that great when you’re living in it. Tom Mullooly: I think the first time I ever heard this was back in the 80’s at a congressional hearing. Someone said, “I mis-remembered the event,” or “I mis-remembered the facts.” It’s the first time I ever heard that phrase “mis-remember” but you’re right. Brendan Mullooly: It’s a good point to keep in mind because if we can remember the past with such rose-colored glasses on when it wasn’t the case, then it’s a good reminder to just be happier in the present because you’re probably not going to remember the mundane stuff that’s weighing you down anyway. You’re going to remember this positively, even though we’re here nitpicking over these things every day that make us unhappy. If we’re remembering … We’re mis-remembering that like 50% of the country didn’t have pensions. What were they doing? The 401(k) didn’t even exist. Where was their money? So they just had no pension and nothing else? I don’t know. I totally agree that there are flaws in the system and different ways that you could approach this, but I’m not sure that it’s just as simple as like everybody used to have a pension and now they don’t, and they don’t save enough, and that’s the problem, or the investment returns. It’s like a confluence of these different things that we’re discussing. DISCLAIMER: Tom Mullooly is an investment advisor representative with Mullooly Asset Management. All opinions expressed by Tom and his podcast guests are solely their own opinions and do not necessarily reflect the opinions of Mullooly Asset Management. This podcast is for informational purposes only and should not be relied upon as a basis for investment decisions. Clients of Mullooly Asset Management may maintain positions and securities discussed in this podcast. Tom Mullooly: Along the same lines, we talk about how people are bailing out of 401(k) plans. They’re not saving money long-term for retirement. It’s going to sound like I’m going way out on a tangent here, and I am. I was watching the Mets and the Yankees play the other night on ESPN, that make-up game. The game was on ESPN and they had, Keith Olbermann was one of the announcers. He hasn’t done a game in 20 years. They started talking in the booth about, “Who’s your favorite Met? Who’s your favorite all-time Met?” Honestly, Eduardo Perez was in there, Tim Kurkjian and Olbermann. None of them … They could all say Tom Seaver. Now, not a single one of them, by the way, mentioned Jerry Koosman. They mentioned Darryl Strawberry, Keith Hernandez, Mike Piazza. They mentioned some of these names, but there was long periods of silence where they couldn’t come up with well-known players who played for the Mets for a long time. Then they said, “Okay. Well, who’s your favorite Yankee?” Holy moly. They rattled off all these names you could think of. Someone, I think it was Tim Kurkjian, raised the point that the reason why the Mets don’t have one of these all-time favorite players other than Seaver is that no one stayed in the franchise long enough to build up that kind of rapport. I guess David Wright would be the most current example, but he hasn’t even played in two years. Tom Mullooly: “I’m just going to take it,” right. Brendan Mullooly: So not to go down another rabbit hole, but why do we attach … If we want people to save for retirement and this is an issue that people change jobs and careers even more often than they used to, then why is this attached to their employment as if employment and retirement are mutually exclusive? People need to retire when they get old because they’re incapable of working anymore, regardless of whether they worked or not. Brendan Mullooly: So, to have some kind of a savings plan where maybe it would just be for younger people with small balances who get forced out of their plans, because oftentimes if you have $100,000 or $200,000, or a more significant sum, they’ll let you keep the money in the old employer plan in a lot of cases, but if you have under 10,000, they’re going to get on your case after a year or so and tell you you have to take the money, at which point, literally taking the money becomes one of two decisions you have: roll it over, take the money. So yeah, maybe a lot of people feel forced into that. Why can’t there be some kind of universal savings account that people can use for situations just like this where it makes a rollover easy? Or maybe retirement plans shouldn’t be through work, and they should have like the same amounts you’re able to put into them, and everybody just has like a TSP kind of thing available to them. Brendan Mullooly: And it never did. Tom Mullooly: -and it never did. Brendan Mullooly: Right, so the idea of being like IRA’s are cool and everything, but maybe they could revamp them, make them easier to get … Make this process where people are leaving a job even simpler, because for the average person, they’re like, “What’s an IRA and how do I open one?” They’re going to end up going to their local bank or something and getting totally hosed if they do that. I’d rather see them take the money in some cases than whatever they’re going to get by doing that, but to make this process simpler, and also allow people to save more in account like an IRA. Tom Mullooly: Let’s just do this on the back of an envelope. Let’s just say that the threshold is, to round the numbers, $20,000 a year, and you work for 30 years. That’s $600,000 if you’re able to maximize the contribution. That’s 600 grand. With some compounding, I don’t know. There was a huge debate on twitter about having a million dollars in a 401(k) account. It seems like that’s a number people can’t reach, but is that going to be enough in retirement? For some people, yeah. For other people, not even close. Brendan Mullooly: Yeah. It’s geographically dependent and lifestyle dependent. Those kind of feed together. It costs more to live in certain places, but it doesn’t seem unreasonable to me to just detach, why is it affiliated with a job? You’re really kicking people in the nuts when they lose their job. They lose their healthcare, they lose their retirement savings, like the vehicle they can do it in, and they lose their income. Those are three pretty big factors in somebody’s life in terms of being comfortable and feeling like they’re providing for their family. Brendan Mullooly: It’s a profit sharing plan. That’s how it came to be. Brendan Mullooly: You can have elective deferrals too, like from your own money. This wasn’t just like the … because the company could stick money in there for you, too, or a company stock or something, right? Brendan Mullooly: Is that where we came from? Tom Mullooly: Yep, and so then it became, “Well, now we’re just going to push the responsibility for funding your own retirement on the employees. If we make a match in a good year, well, lucky you.” I know we’ve stressed this in other videos and other podcasts, but even maxing out your retirement plan is not going to be enough. Brendan Mullooly: -and you’re putting $20,000 a year in. You’re not going to do that. Brendan Mullooly: Right, that’s what I’m saying. Tom Mullooly: -into a retirement account. Brendan Mullooly: You should save a healthy percentage of your paycheck and not just take for granted that 18.5, or whatever the number may be in the future, is enough. I agree with your point that it may not be… It may be enough for some people. It may not be enough for other people. I think it’s unreasonable to expect people to save more than 1/3 of their income. Geez, how are you doing that? Tom Mullooly: How are you doing that? Brendan Mullooly: How are you paying all your other bills? Tom Mullooly: Yeah. Okay, so last question before we wrap up. We mentioned him a few moments ago, Michael Batnick, friend of the show. Is he going to get involved in a fantasy football league at work? Brendan Mullooly: I don’t think so. Tom Mullooly: That was one of the better videos that they put out. Brendan Mullooly: That video was funny. Tom Mullooly: It was pretty good. Brendan Mullooly: I want to see who wins their league. That’ll be interesting. Tom Mullooly: Yeah, remains to be seen. Tom Mullooly: Thanks for tuning into episode 224. We will catch you on the next one.